A World Alone lyrics by Lorde - The lyrics to Lorde's songs from Melodrama and Pure Heroine. The final track from Lorde's chart busting album Pure Heroine. That slow burn wait while it gets dark, bruising the sun. I feel grown up with you in your car, I know it's dumb. We've both got a million bad habits to kick, not sleeping is one. We're biting our nails, you're biting my lip, I'm biting my tongue. Let 'em talk 'cause we're dancing in this world alone, world alone, we're all alone. They're studying business, I study the floor, and you haven't stopped smoking all night. Maybe the Internet raised us, or maybe people are jerks. All the double-edged people and schemes. They make a mess then go home and get clean. You're my best friend, and we're dancing in a world alone, a world alone, we're all alone. You're my best friend and we're dancing in a world alone, a world alone, we're all alone. 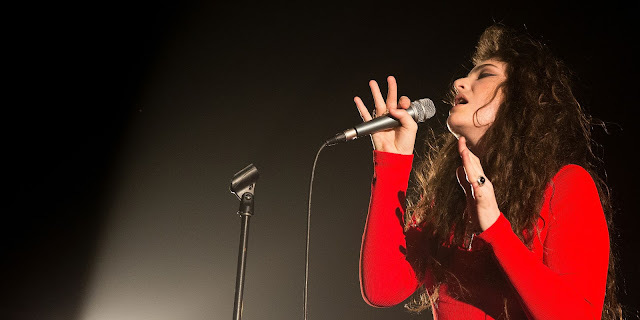 Check out the lyrics to other Lorde songs from Pure Heroine - Tennis Court and White Teeth Teens.